I always feel in good hands when I see a book with Steven Lynch's name on it and the Wisden Guide to International Cricket 2012 remains an invaluable source of information for international cricket fans. The book concentrates on player profiles of 200 leading players which include photographs,resume, profile, facts and figures for these players all on one concise page. Of course, not everyone can be mentioned and the player profiles are edited versions from ESPN Cricinfo with their kind permission. For any players not mentioned here, details can be found on Cricinfo's website. There are also sections on cricketers from Afghanistan, Canada, Ireland, Kenya, Netherlands and Scotland whilst Zimbabwean players, in the main section of the book, make a welcome return. It is also very good to see a decent section on officials which includes umpires, referees and coaches. The forty page statistical section towards the end of the book gives in depth figures for each Test playing nation in both Tests and ODI cricket as well as giving overall Test,ODI and Twenty20 cricket records. All statistics in the book have been updated to September 26th 2011. A useful international schedule completes this invaluable book. 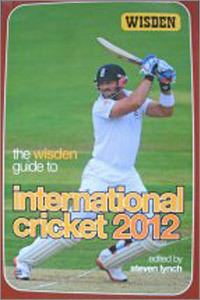 An easy size to carry around at a decent price makes this a must for any international cricket fan.